Closest cracked moon I could find. As the Imperial Exams1 drew near, candidates all over the empire began to congregate in the capital. The rooming situation became so bad that even complete strangers had to share rooms. One candidate arrived late and found himself in an impossible situation. He begged to be allowed to spend the night in the barn. Even this was not possible as they were fully filled with horses and mules belonging to the lodgers. At last the exasperated candidate pestered one innkeeper so much that he was finally told that there is always an empty room at this certain inn because of its unsavory condition. The scholar replied that it is better to have room and shelter than be drenched in the impending rain. However he warned the innkeeper that he would have a taste of his sword2 if this was a ploy to be rid of him. “When you first you asked if there was any available room, I honestly told you there was none. All rental rooms are occupied; but now you asked me if there was an empty room… Why, that’s a different story. Indeed I have such a place. With that the scholar was shown to the room. The room was very dusty but livable, otherwise it just looked like any other ordinary room. “I rather spend the night with the ghost in the room rather than be drenched in the cold night rain!” grumbled the scholar. Very soon the candle was blown out and the scholar retired to bed. The rains came and kept him awake. Finally it stopped and the scholar was able to doze off. However peaceful sleep was not in the cards as he was soon rudely awakened by soft groaning and moaning. As the sounds grew louder, the scholar became more irritated. He peeked out of the bed and was getting ready to slice up whoever the practical joker may be out there. Peering into the darkness and with the help of the moonlight beaming through a nearby window, he was able to discern a white translucent wraith-like apparition forming in the room. The temperature seemed to drop several degrees. Soon it coalesced into a shape of a young man. Tingles crept up the scholar’s spine. The apparition did not move or pay attention to anyone or anything. It just stood with its back facing the scholar and staring at a blank wall. Its wailing was like a chant of some sort; peppering the rhythm with sorrowful sighs. An hour or so, the apparition turned around and began to pace the room, walking towards our hero who abruptly fainted right in the bed, still holding his sword. The scholar suddenly sprang up in a defensive posture; brandishing his sword menacingly, startling the innkeeper to no end. “What’s the meaning of this!” demanded the scholar. “Hah! As I had told you before, being an upright person, I am not frightened by such mere apparition!” Our scholar said, lying through his teeth. The innkeeper was more impressed by the words than by that gleaming sword. Soon both calmed down and were greatly relieved. 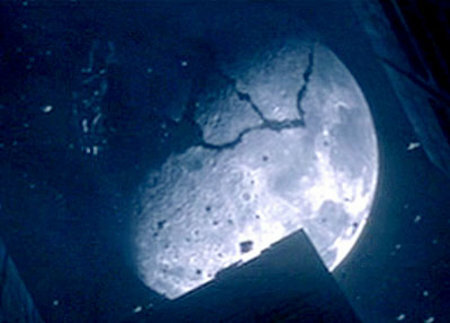 The lattice window fracturing the moon. Already, a gleeful innkeeper was thinking of the future money made from that room once more. After a good meal, in the following evening, the scholar read his books and went to bed at his usual hour. Right on the dot, at the appointed beat of the 3rd watch, sounds of groaning and moaning were heard once more. The apparition appeared and formed at the usual spot. Our hero was more than ready this time. When the ghost heard the words, he looked stunned and astonished. He began repeating the matching line a few more times. Then for a fleeting moment, a smile broke out on its face but sadness soon returned. Shaking his head as if to acknowledge his lack of literary savvy… Finally, with a sigh, the ghost bowed to the scholar in acknowledgment and began to fade away in contentment. The next morning, the innkeeper came knocking on the room gently. Our smug scholar was in a much happier mood having a good night’s sleep and a job well done. “What did you do?” exclaimed the innkeeper with a not too sure a look on his face. The innkeeper went and looked at the wall. Five more characters were added to the left of the original column9. With that, the innkeeper took out a wet cloth and wiped out all the writing on the wall. And that’s the end of the story my dear friends. What? That's the end of the story? I’m sure you all are asking the same question – Where's that damn answer? Don’t worry, I’m not that rascal in the story turning my friends into obsessive apparitions. This is just to let some of you be the hero of the story and try your hand at completing the couplet. One possible answer appears at the end of the notes. This story was told by my maternal grandmother when I was a child. She was an illiterate woman. She was especially proud in recounting stories with literary values. In those days, I was more intrigued by the eerie circumstances and excitement than the story’s couplet. However as I grew older, I began to appreciate the couplet more than the story itself. I believe this is a Cantonese story because the matching end of the couplet contains colloquial Cantonese terms that a Mandarin speaker may not understand. 2. Not all scholars are bookworms. Some are well versed in the martial arts (文武雙全) too but they are a rare breed. 4. Unlike the safe and sound hospitality industry of today, in old China or anywhere else for the matter, travelers are skittish about places they stayed for the fear of being robbed and killed. Such places are termed in Chinese as “black inns”(黑店). 5. A euphemistic term for a fox demon (狐狸精). It is believed that foxes turned themselves into beautiful women to seduce young men for their Yang vitality to nourish their own Yin counterpart. Has the same connotation as the word “vixen”. 6. It was considered an extremely virtuous deed in helping to bury the dead, in old China. More meritorious if the dead could be brought back to its hometown for burial. 7. It is believed that the lower soul (魄) would return to see its corpse and bid farewell to the family for the last time after 49 days (七七四十九日). The superior soul (魂) had long departed to heaven etc the moment the person died. 8. A polite term for an elderly person. In this case the scholar is ingratiating himself to the innkeeper. 9. Traditional Chinese is written from top to bottom, from left to right. When vertical writing is not possible, it is written from left to right. The modern style used in mainland China is from right to left. 花窗攕碎月 The lattice window fracturing the moon. 曲行抝攣風 The crooked lane warping the wind.